E-Chart Holder for Hawker Aircraft. E-Chart Holder secured under Writing Pad Clips. Fits Hawker 800, 850, and 900 series aircraft. 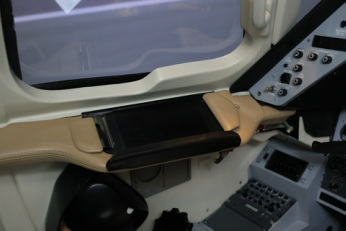 Fits securely into writing tablet clamps located on either side of cockpit under the "B" windows. Keeps iPads, Androids, and other tablets in an out of the way, yet easy to use location. 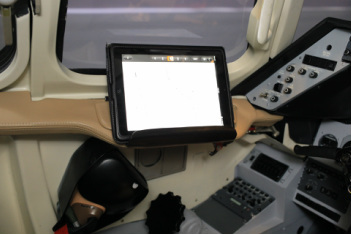 This provides pilots and co-pilots ready access to electronic charts (E-Charts) and maps. As many of you know I was diagnosed with stage 4 cancer in 2013. I have Metastatic Melanoma in my arm and lungs. Complications with the test study drugs lead to other issues and I suffered a ruptured colon in January of 2014. I spent the first two months of 2014 in the hospital and because of some complications from the surgery and the stage 4 arthritis I have in my hips and knees I am unable to make it to my workshop on a daily basis. I appreciate all of the kind words and wishes that have been sent to me this past year and ask for your patients if our average 2 week delivery time runs a little longer sometimes. Please read our "Important Notice" page.